NSA’s 73rd Annual Convention is coming to Minneapolis on August 23 through August 25, 2018! NSA is excited to announce the 73rd Annual Convention in Minneapolis this coming August. Like every NSA event, attendees can expect excellent education programs as well as social and networking time. Prior to the opening of the convention, we kick off the week with the popular NSA EA Exam Review Course from Monday, August 20 – Wednesday, August 22. This year’s Leadership, Networking Conference & Legislative Strategy Meeting will be held from Wednesday, August 22 to Friday, August 24, in conjunction with Annual Convention programming. Thursday, Friday, and Saturday will be dedicated time for continuing education focusing on topics including the Federal Tax Cuts and Jobs Act, identity theft, cyber security and how to protect your practice, plus estates, gifts, trusts and more. Earn up to 16 hours CPE and get the well-rounded education you don’t have access to anywhere else. The Spouse/Guest Package is intended for guests of NSA members and is not available to NSA members. Reserve your room by July 30, 2018 to receive the discounted group rate. 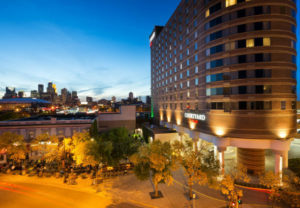 Experience the spacious style of Minneapolis Marriott City Center. Our pet-friendly hotel welcomes guests with generous rooms and suites, excellent service and a premium downtown location. Relax into your Minneapolis, Minnesota getaway when you arrive at your oasis-like room or suite. Every room features stunning views of the Twin City skyline, plush bedding, convenient plug-in panels, Wi-Fi access and ergonomic workstations.